Our Bible study program has been created for people of all ages and denominational backgrounds. We want to get people to read the Bible and help them develop a person quiet time with God. Our tools integrate some of the best practices that have empowered Christians for generations to learn how to commune with God. Since we have both digital and printed versions of these tools we are encouraging people of all ages to study their Bibles on their own and come together to encourage one another. 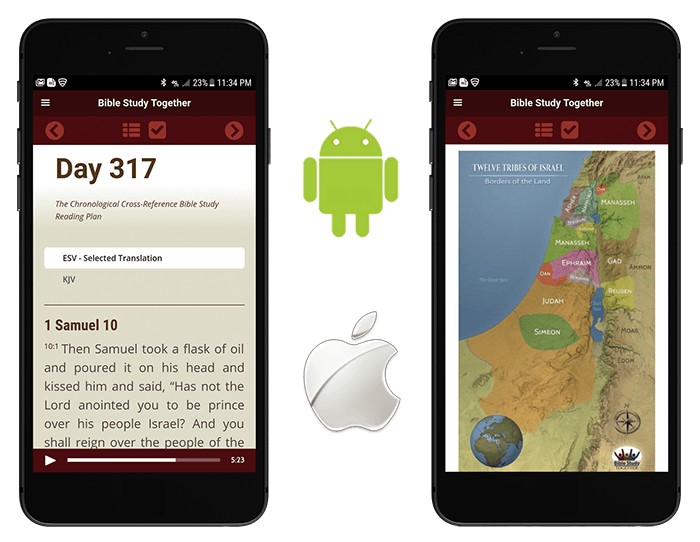 Our mobile app let you conveniently read the Bible in both King James and ESV using our unique reading plan. In addition, our app has study questions, 3D maps, videos, and daily challenges all integrated into the reading. You can track your day based on your reading schedule or by checking off what you have read. To learn more and get set up to read on your mobile device or computer click the “Get Started” button below. If you have a favorite study Bible, translation, or just don’t like reading from digital screens, we have the tools for you! We have created full-color booklets that contain the entire 2 year reading plan. Our booklets have a tough card-stock cover and the whole booklet (including the inside pages) are glossy coated to protect it while being used for years to come. We offer these booklets to you at our cost to print and ship them. To learn more about how you can get order booklets click the “Order Booklets” button. 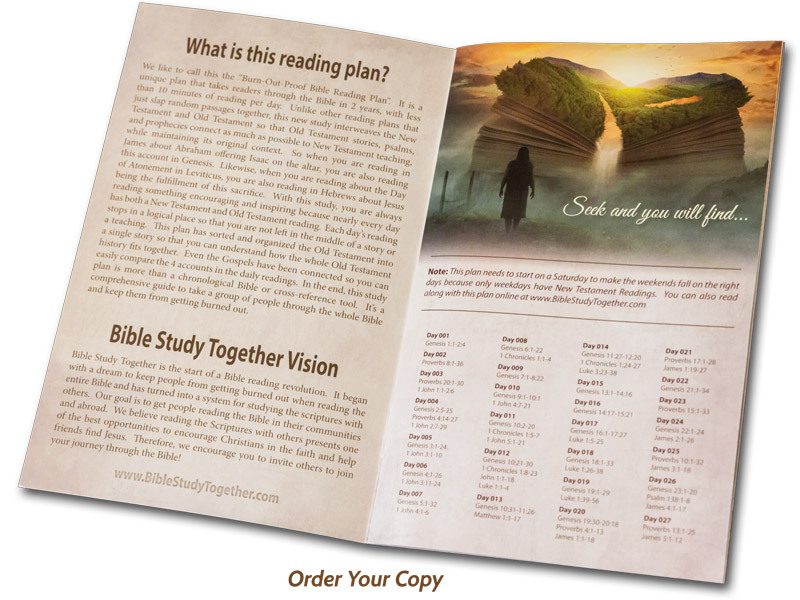 Our Bible study journal can be ordered from Amazon.com or you can print it yourself and put it into a three-ring binder. Each days has our unique powerful reading plan, study questions, space for taking notes, and a daily challenge. The printable study journal and the four volume set book edition is the ultimate tool for people who want to enhance their quiet time by recording their thoughts from each day’s reading, prayer requests, answered prayers, and daily events. 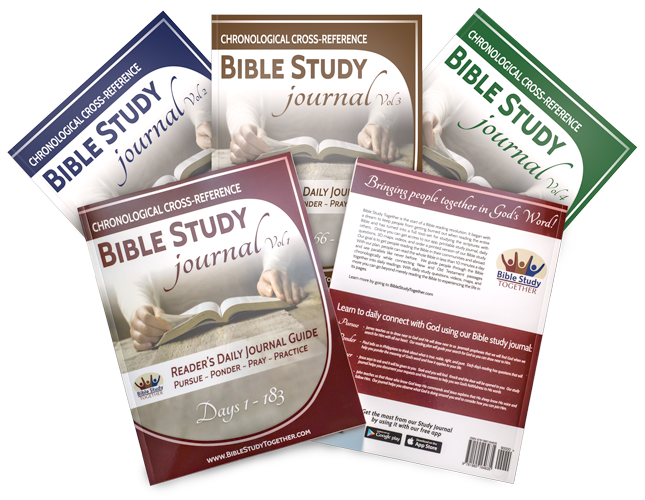 To download and print the Bible study journal or order your own copy click “Start Using Our Study Journal”. We plan to continue adding resources here as they are developed. Some of the extra tools that we plan to develop in the future include an app and life application videos.